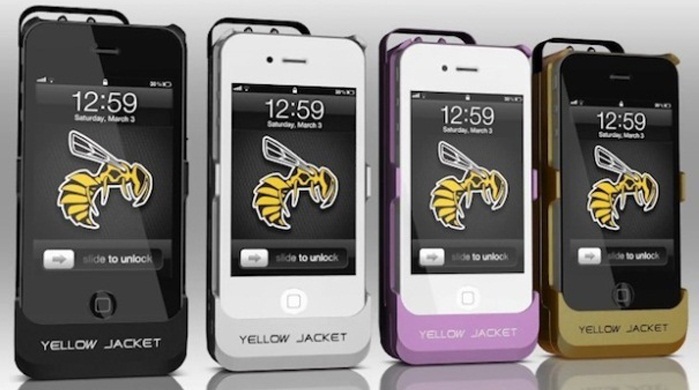 Yellow Jacket is a case for the iPhone 4 and iPhone 4S that doubles as a 650,000 volt stun gun to defend against attackers and thieves. The company recently ran a fundraising campaign on Indiegogo that offered an exclusive Early Bird special price of $85 for the iPhone case. They will normally retail for $125 with your choice of color in black, white, or pink. 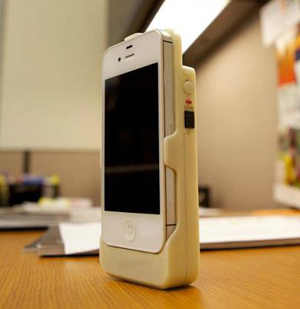 A couple of inventers from Baton Rouge, Louisiana have created a case for the iPhone 4 and iPhone 4S that is also secretly a powerful stung un. The idea behind the product is to have a practical self-defense tool added to something that you already have on you at all times. There are plenty of individuals with pepper spray and Tasers in their purses or on their keyrings, but usually these do no good when a surprise attack happens. It’s pretty safe to assume however that you’d be far more likely to have your smartphone on you at all times. Yellow Jacket founder Seth Froom came up with the idea after actually being robbed at gunpoint in his own home. He even created a re-enactment clip to go along with the product’s advertisement campaign video. Froom says that he was frustrated that even the guns he had in his home couldn’t protect him at the time, since they were out of reach during the break-in, and resolved to come up with a defensive weapon that would be on him at all times. This is a pretty safe assumption to make considering that most people who are about to be mugged are probably already thumbing through their iPhones anyway. 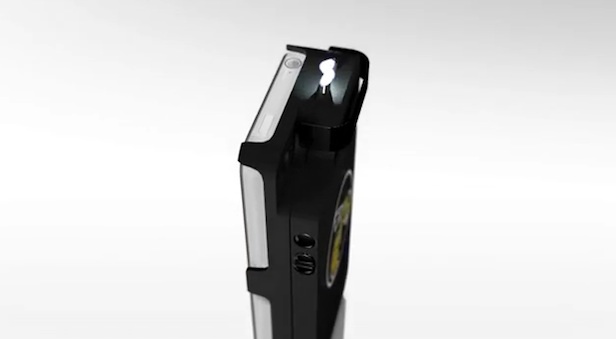 The stun gun, which looks a lot like your regular run of the mill iPhone case, delivers a shocking 650,000 volt zap of electricity, and has its own built-in battery. The electric charge is enough to bring down a “fully grown, aggressive, adult male,” says Froom. Unlike regular stun guns however, which can take several seconds to locate and use, the Yellow Jacket is easily deployable with one hand and ready to zap would-be attacked in less than two seconds. 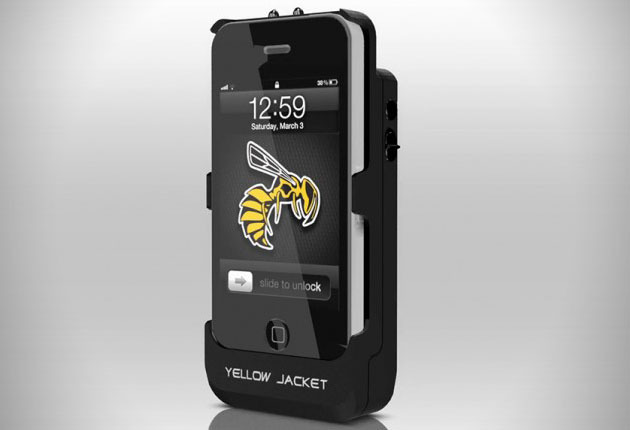 The Yellow Jacket Case has another effective use for your iPhone that’s great as well. The case is able to extend your iPhones battery life to 20 additional hours. A switch on the bottom changes the power from the stun gun standby to actively charge your iPhone. Just make sure that you don’t use too much of the battery or the case will become virtually useless for self-defense. That is of course unless you throw the thing at your attacker. The case alone weighs around the same as the iPhone (4 ounces) so using it doubles your smartphone’s weight to over 8 ounces. The unit is a total of 1 inch thick and adds a total of 3/8 of an inch to the height of the device. A bit bulky but suitable for a concealed defensive weapon when you think about it. But let’s address the elephant in the room here. Just how smart is it to place a 650,000 volt5 weapon next to your face when you’re having a quick chat? Luckily, the case has a couple of safety features to prevent those lively accidental misfires. The Yellow Jacket iPhone case has a rotating electrode cap that blocks off the dangerous part until needed and a safety switch disables the device. These precautionary mechanisms should “prevent unintentional shocks from occurring,” says Yellow Jacket’s creators. “I do see a lot of mishaps and drunken bar tricks happening,” says PC World’s Cocilova, but I also “see a lot of good coming from a device like this.” The team claims that in less than a second, both of these features can be disabled and ready to take on an assailant. The Yellow Jacket is being pitched on fundraising site indiegogo.com, and will be available in three colors: Black, white, and pink. The Taser case will eventually retail for $125, but right now, the price tag is $85. Interested parties are advised to check with local law enforcement for state restrictions beforehand. And fret not, non-iPhone owners — Yellow Jacket creators say an Android version is on the way. I see a lot of good coming from a device like this. If there was a chance anyone could have a stun-gun on their phone, it may ward off the next purse-snatcher. However, I do see a lot of mishaps and drunken bar tricks happening as well because shocking yourself just wasn’t as funny as you thought it would be. And you’ll want to check with your local law enforcement agency to see if there are any restrictions on carrying something like this.